There's something so wildly romantic about a honeymoon in Africa. It’s more than just the way being in an opposite season make you feel so perfectly far away from home. There's something so wildly romantic about an African safari honeymoon. Maybe it's the wildlife, the otherworldly senses, sounds, and smells of the place, or the way being in an opposite season make you feel so perfectly far away from home. Or maybe it's just the fact that these four spectacular camps and lodges are quite literally among the most romantic places you've ever had the pleasure to stay. In this 12-day itinerary, we pull out all the stops to grant you the trip of your dreams. You’ll safari in some of the best wildlife viewing areas on the planet, snooze on romantic sleeping platforms beneath the stars, soak in outdoor bubble baths, and so much more. Bring along your sweetheart, fiancé, newly-wed, or partner of 25 years—you name it. This is the ultimate trip for two in Southern Africa! Please note that the listed rates are based on two travelers and can change significantly depending on the time of year. Don't be fooled, this trip is a phenomenal choice for more than just honeymooners. Four base camps in South Africa and Mozambique come together to make the ultimate cool retreat. Kick things off at Garonga Safari Camp, your home for the first three nights. An hour and a half away from Kruger National Park, Garonga is located within much quieter Makalali Conservancy. With only six luxurious tents, you’ll get to experience this world-famous area as if you had it nearly all to yourself. Garonga Safari Camp promises a “safari for the soul,” and they deliver. The light and airy rooms blend tactile plastered wall construction with classic canvas rooftops, wooden decks, plush draped beds, indoor and outdoor showers, and our favorite part—hammocks where you can take in the wilderness from the privacy of your own porch. Aside from wonderful daily game drives that meet our highest GO expectations, Garonga offers a few especially romantic perks, like the lantern-lit bush bath, the “Sleep Out” deck with a four-poster bed, and of course, the private massage sala. You’ll be fully into the swing of safari life after a few days here! Nestled into a canopy of 100-year-old trees overlooking the Sabie River, Narina Lodge is reminiscent of your childhood treehouse dreams on a much grander scale. 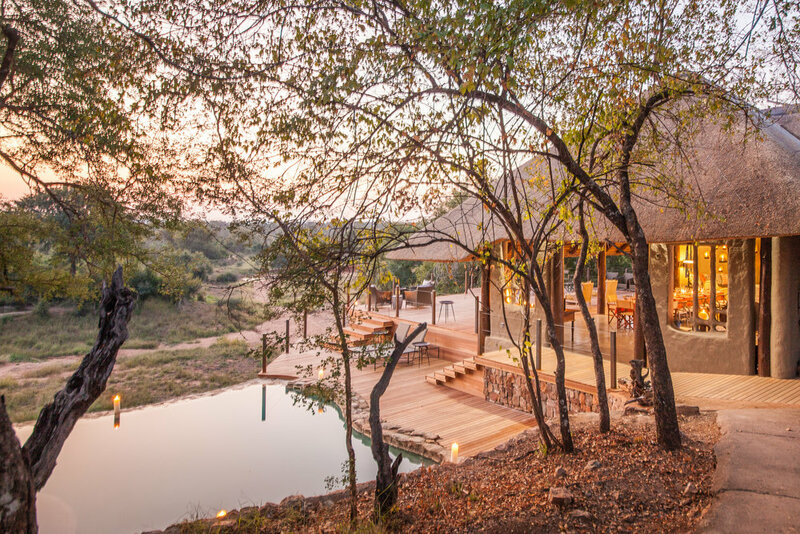 The nine private suites are linked discretely via raised wooden walkways that transport you through the thick foliage, creating a setting that is certainly unique for South Africa. Although located in the south of Kruger National Park, you’ll experience a private stay that takes advantage of the hidden corners of the park’s 7,523-square-miles, where more mammals reside than any other game reserve on the planet. When you’re not enjoying the wildlife, kick back in your private plunge pool, laze on your bed with a good book, or soak in a bubble bath for a truly transcendent stay. There are only a handful of truly unreal properties around the world, and Kingston Treehouse is one of them. A traveler favorite, this sensational outpost is the real-life definition of romance. You’ll get to spend a night here elevated above the savannah on stilts, surrounded by nothing but a trillion stars and the sounds of Africa coming alive around you as the sun sets. Don’t worry, there’s a bathroom and shower tucked away behind the four-poster bed, and radio communication connects you to the staff in case of emergency. All that’s left for you to do is enjoy this once-in-a-lifetime sensory experience in South Africa! The grand finale of your stay is at this gorgeous beach-side retreat on the Indian Ocean. White-washed walls are the backdrop at Santorini, filled with airy rooms, private balconies, and sea views from nearly every angle. During your stay, immerse yourself in the turquoise coastline with kayaks, stand-up paddleboards, a round of beach volleyball or tennis, or with a fishing line. Of course, snorkeling is a favorite pastime for many of our guests who enjoy peering into the beautiful Bazaruto Archipelago teeming with marine life. Ready for an adventure on a grander scale? Get behind a boat on a pair of water skis or on an inner tube for an afternoon of adrenalin-fueled fun for the whole family. Kite surfing, horseback riding, and scuba diving are also available while at Santorini. Just say the word and the expert guides on location will make your Mozambican dreams come true.